Holgas are made of plastic and are notorious for having light leaks. That is, the plastic edges don’t seal very well when you finish loading your camera. Light sneaks in all those edges and impacts the film. Having a little light leak is fun and adds character to the image. Having a lot of light leaking in can just destroy the image. I highly recommend getting blue painter’s tape for this. It is sticky enough to hold, dark enough to block light, but also it peels back off fairly easily. That way when you have to load and unload your Holga camera it’s fairly easy to get all that blue tape off. 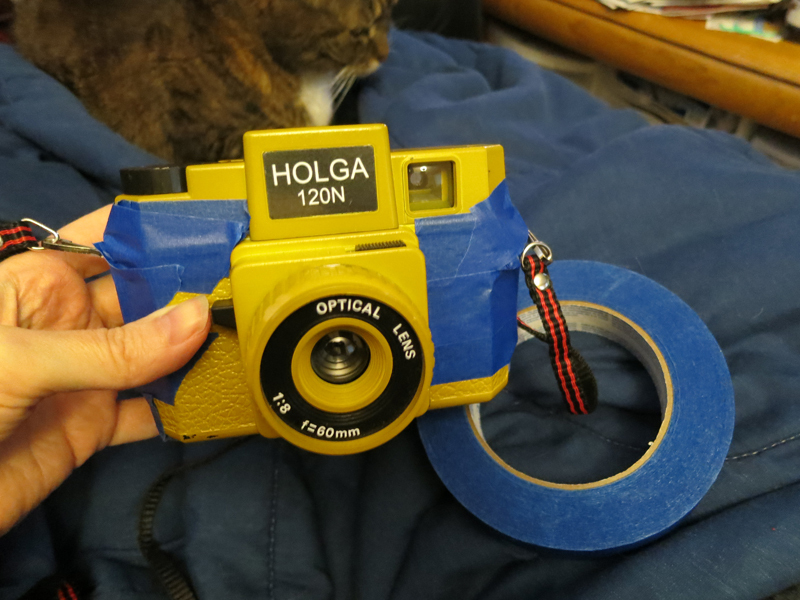 Once you load the film in and seal the Holga camera up, you’ll want to tape it up fairly quickly. Start with the left and right sides. Do a series of short tape strips down each side right over the metal slides that hold the back on. Not only does this block the light but it also keeps those slides from accidentally coming loose. Next, tape along the entire bottom. This one is fairly easy – one straight tape strip should do. Then for the back window. This needs to stick on a bit better because you’ll be using it quite a lot. I tend to use black electrical tape for this. That way it reseals each time I have to open it up to wind to the next image. Taping it up can feel awkward the first few times – but once you get the hang of it you’ll be whipping off the tape, unloading the old film, loading the new film, and sealing it back up in under a minute. It gets to be quite easy. Practice helps!